Earn daily with the most sought after pet product in the world, where our experts advertise for you! Become a PP Affiliate Partner and enter your own Back Office where you'll find your personal PP website with a unique ID number, promotional material, education, statistics and more. You'll receive an advertising campaign for FREE with our expert marketing team promoting and making sales for you! No monthly fees, no sales quotas, no obligations. 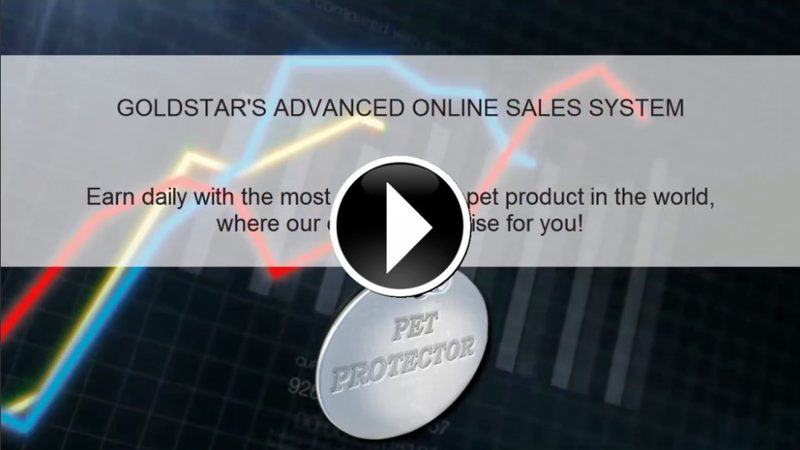 Log in to your own Pet Protector Back Office and watch the results of your advertising campaign. We'll direct targeted visitors from all over the world to your PP site, where they can learn more about our product and simply use a Credit Card to place their order. We take their order and deliver to their home address anywhere in the world within 72h. Customer Care, a money-back guarantee, returns and re-deliveries are all our responsibility. Whenever a sale is made through your website, you earn $10, $15 or $20, plus a $50 Super Bonus for the first 5 sales! We pay you out your earnings directly to your Bank Account. Watch the video below to find out how we do it! How About Making Your First Sale Today? 3. Sit back and watch the results! No chasing after friends and family, no rejections, no sweating. Our professionals will perform the entire sales process for you - professionally! Join free by filling in the form (no Credit Card required) and we will give you a full 30-day period to promote our product and make sales. You are able to upgrade to any package described down below at any time during your trial and from that moment on, you will be able to continue your business as our official Affiliate Partner and earn $10, $15 or $20 per each sale you make, plus a $50 Super Bonus for the first 5 sales you make! Additionally, you will receive a gift of 50, 100 or 500 targeted website visitors to your Pet Protector affiliate website and start seeing results right away! 1. A unique link for your personal Pet Protector website. 2. Marketing material including banners and email examples, as well as our amazing Sales Handbook which contains step-by-step instructions on how to become a Sales Pro! 3. A list of your Customers. 4. An option to use our Company's advertising system where we promote your affiliate website for you! Can you make 100-200 sales per month? With the entire world as your market and the power of our professional advertising system, it's more than possible! You can surely give it a try - it's FREE! With 12 Million pets born each and every day, this business category has the highest potential growth rate! I have a Labrador with liver damage caused by using several chemical products that I applied on him almost every month for years. When my brother told me about Pet Protector I couldn’t believe it, it sounded too good to be true, so I decided to give it a shot. It’s been over two years now and I couldn’t be happier with this product. The last exam showed that his liver has greatly improved since I stopped using chemical products. I joined the Pet Protector affiliate program and have grown a team of over 5,000 distributors in a much easier way than in other companies I've been involved with. I’ll never stop recommending Pet Protector, because it saved my pet and brought long desired quality to my family's life. I joined Pet Protector when I adopted my dog Harlow. Immediately I learned that the toxic medications made her extremely ill. After an on-line search I found the Pet Protector Disc. It worked so very well that I looked at the business model. After signing up to become a Distributor I soon learned that I had found a company with integrity. Never in my career on-line or off-line have I worked with a company that supported their Distributors, listened to their Distributors in a manner even close to Pet Protector. To my knowledge there is no other company that closes business at the end of the month, and the Distributors have their pay-checks in their bank accounts the first week of the following month. Pet Prospector is by far the best business I have ever heard of.